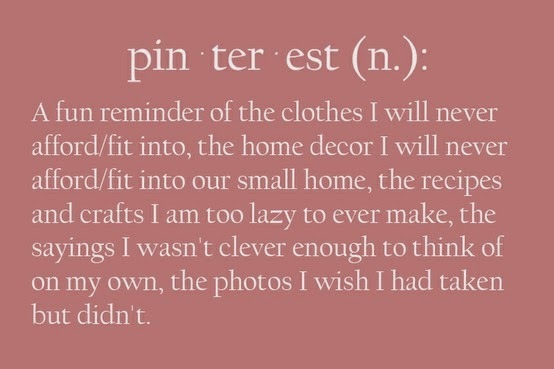 I find Pinterest to be the great escape. In a bad mood at work? Spend five minutes on Pinterest looking at beautiful bathroom designs for a house you don't have or exotic vacation destinations for a trip you're not planning and, boom! Instant happy mood. It's the internet version of daydreaming and the great American pastime of lusting after material things you don't need and can't afford. I quickly scan past the overly dramatic life lesson quotes, and the "10 Tips for Throwing a Beautiful Backyard Soiree" and "How to Make your Own Laundry Detergent" pins. Those just make me feel inadequate or annoyed. WHO makes their own laundry detergent and WHY? Much of my Pinterest scanning these days involves wedding planning. Most of my plans are done, but I only get to do this once. So I'm going to look at every darn wedding pin I can before I get married. Sorry I'm not sorry. In the midst of bouquets and centerpieces, I'll pin a cupcake recipe (that I'll probably never try) that gets repinned a dozen times. By the way, mediocre dessert recipes will always get repinned 10 times more than that really unique thing you found and were really proud of, guaranteed. Not that this is a competition or anything, but you know what I mean. And then as I scan past the outfit-I've-seen-repinned-400-times pin and a few thigh-trimming workout pins (don't you wish those worked? ), I'll see pins from my mom-to-be friends about having and raising children. Out of curiosity about what I may be facing in the future, I click on them. Sometime later I look up and it's midnight, and I realize I've been reading about childbirth for the last 45 minutes. Why do I suddenly know so much about contractions?! As someone who likes to do research and be prepared, I am just going to consider this curiosity and weird habit a good thing. If this translates in any way like my wedding planning habits, it may actually serve me well in the future. I had been making mental wedding notes for a few years before I got engaged. I wasn't doing it in a pathetic, pining away manner, but rather as a sensible planner, because I am practical to a fault. In my head I already knew what venue, photographer, and bakery I wanted for my big day...even what song I wanted to walk down the aisle to. And guess what, I'm using every single one of those. Sure saved myself a lot of time. Unfortunately babies and children are much more unpredictable and difficult than choosing a wedding band or a cake flavor. But that's even more of an argument to read those pins about kids every once and awhile, even though they aren't in my plans for a few years. And thank you to my friends who are doing the baby thing before me. By the time it's my turn, you all will be experts and I won't even need Pinterest. You'll just be able to tell me how it's done. So take good notes!